I can't get enough of Blake Lively's style!! From casual to glamourous she has a style that everyone wants. And I love that you never know what to expect from her because she has so many different styles. I love this time of year!! I had such a fun time hosting our last fit camp of 2017 (Yes I'm also a coach and trainer. ;). And of course I had to add in some Christmas music to my workout playlist for the last fit camp, this is definitely going to continue. Personally I like to mix up the Christmas songs with other upbeat non-Christmas songs to keep it fun for those who are not as into it. #trainertip lol. But literally just rock out your Christmas spirit. haha!! "Sleigh Ride" - Karmin - So good, I love how upbeat it is. Perfect for sweating it out! 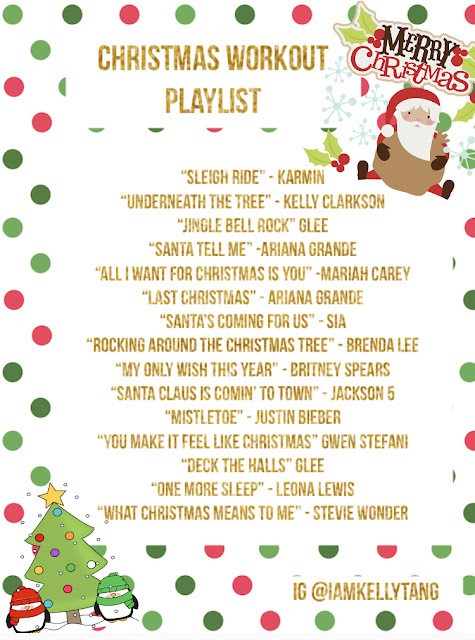 "Underneath the Tree" - Kelly Clarkson - Can't go wrong with some Kelly C.
"Jingle Bell Rock" -Glee Cast Version - Somehow a Christmas isn't Christmas without some glee songs. "Santa Tell Me" - Ariana Grande - I've been replaying this over and over again. Her voice is just so amazing though.